The domestic yak (Bos grunniens) is everything to the people of the Himalayas that the American bison was to the Plains Indians -- food, fuel, clothing, tools, shelter -- and even more. 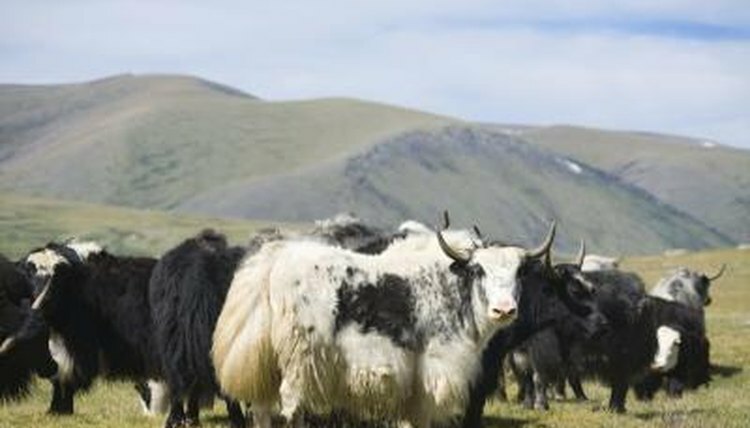 Yaks give them a soft, downy fiber that can be spun into yarn and made into fabric as soft as the fabled cashmere. Like other animals that live in the high Arctic, the yak wears a double coat. His overcoat is long and coarse to repel rain, snow and ice, while his underwear is short and fluffy to retain body heat in temperatures as low as 30 degrees below zero. In the spring, his undercoat comes loose and can be removed by combing. Once this down is cleaned of coarse outer hairs, it can be spun into yarn that is among the most expensive in the textile world, since each yak produces only a pound or two of it each year. Yak down is very fine, which contributes to its softness. Human hair measures some 60 to 70 microns in diameter, while the down of a yearling yak is 15 to 17 microns and an adult's 18 to 20 microns. Few natural fibers have a smaller diameter, but those include the musk ox and the vicuna, which are wild animals. Their fiber is therefore much harder to get. Musk ox down or qiviut must be gathered by hand as the animals shed it and it catches on vegetation as they wander. Free-roaming wild vicuna must be penned up and wrestled down to be sheared, which is stressful for both the shearers and the sheared. Yak down or khullu, on the other hand, can simply be combed off the animal with no more drama than the morning milking. A second factor in the softness of yak hair is the smoothness of each strand. Every animal's hair has a different surface texture, and yak down under an electron microscope looks scaly. These scales fit tightly against the surface of the hair shaft, which makes it feel very smooth and therefore soft. It also makes it more difficult to spin into yarn, but this problem is offset by the high commercial value of that yarn. The third reason yak down is so soft is its crimp. Crimp in textile-speak means bends or folds in a fiber. Picture a girl who has worn her hair in tight braids all day so that when she loosens it at night, each strand continues to show the twists and turns formed while it was braided -- that's crimp. Yak down has so much crimp that it looks like a coiled spring that has been mashed flat. Crimp imparts three qualities to a fiber. Stretch a strand so that the coils of the spring move apart; release it and the coils snap back together -- that's bounce. Compress it and the coils get even closer together; remove the pressure and they spring apart again -- that's loft. Mix it with other fibers and it meshes with them, trapping micro-pockets of insulating air -- that creates warmth. Put all these qualities together and you have one of the softest, lightest, fluffiest and most luxurious fabrics in the world of textiles. Craft World: What Is "Crimp" In Fiber?